· The music of the album was used to accompany the Baron and Bailey Light Circus at the Museum of Contemporary Art and was an integral part of the Circus's audio-visual presentation and performance; the album did not see it's first full, official commercial release for more than 40 years. · ONLY ABOUT 100 COPIES ARE BELIEVED TO HAVE BEEN MADE (AND EVEN LESS ACTUALLY HANDED OUT TO THE BARNUM & BAILEY VISITORS), OF WHICH WE CAN COMFORTABLY SAY THAT LESS THAN 50 COPIES SURVIVE; COPIES IN GOOD CONDITION ARE PRACTICALLY UNKNOWN (WE DO NOT BELIEVE A TRULY NEAR MINT COPY HAS EVER BEEN SPOTTED), AND THIS IS EASILY ONE OF THE FINEST SPECIMENS EXTANT! 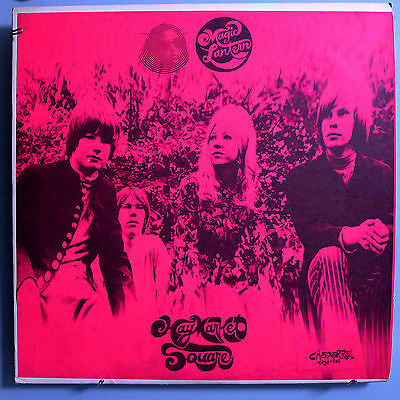 · EASILY ONE OF THE TOP-20 RAREST AMERICAN RECORDS IN EXISTENCE AND ONE OF TOP-10 RAREST PSYCHEDELIC RECORDS KNOW. IN TERMS OF SHEER RARITY, THIS INCEDIBLE PIECE SCORES OFF THE CHARTS AND STRAIGHT INTO THE STRATOSPHERE. EVERYTHING YOU ALWAYS WANTED - AND EXPECTED FROM A SUPREMELY WELL-DONE PSYCHEDELIC RECORDING SESSION IS HERE, AND MORE AND THEN QUITE SOME: SCREAMING, DISTORTED, FUZZY AND CRUNCHY GUITARS; MIND-TRIPPING LYRICS, WARPED TIME SIGNATURES; SNOTTY, GARAGEY AND TOTALLY HALLUCINOGENIC DELIVERY; CRUDE AND BARE-BONES PRODUCTION; SOARING, SPIRITUAL FEMALE VOCALS AND VICIOUS, BLISTERING RHYTHM SECTION; TO MAKE THINGS EVEN MORE INTRIGUING, THESE GUYS (AND A GIRL) WEREN'T EVEN FROM THE WEST COAST, ALTHOUGH 90% OF THE LISTENERS WOULD CONFUSE THEM FOR A SAN FRANCISCO BAND IN AN INSTANT; IN FACT, THE GROUP HAILED FROM CHICAGO! · ORIGINAL, THICK CARDBOARD COVER (AMERICAN STYLE): THIS IS A CRUDELY CONSTRUCTED COVER WITH SCREAMING-PINK DAY-GLO PAPER SLICKS PASTED ONTO THE WHITE CARDBOARD; THE SCREAMIN-PINK COVER IS PARTICULARLY VISUALLY STRIKING, BOLD AND HYPNOTIC. ESSENTIALLY, YOU CAN TRIP TO IT WHILE YOU ARE LISTENING TO THE DISC. This album right here is one of the rarest psychedelic rock albums ever released. If you want the original first pressing of this LP you'll need to pay few thousand dollars for it depending on the condition of the record. There were only 100 of these first pressings made so it's very easy to understand why this record is so valuable. Record collectors consider this as one of the biggest psych jewels there is. And what about the music? The music is very classy psychedelic rock with awesome instrumental work and pretty long songs. The lead vocalist Gloria Lambert does a good work too. "Train Kept-a-Rollin'" ain't as impressive as the other five numbers but it's a quite nice version of that song too. Rest of the songs are their own material and those are all more or less perfect. Just listen to "Amapola" or "Funeral" for example and you'll understand. That album cover is brilliant I think. It's so simple but that pink color is really magical. I like this record very much but I'm having some difficulties with my rating. I'd like to give this album five stars since this is really remarkable experience of psych rock. But on the other hand there are some parts ("Train Kept-a-Rollin'") that aren't as perfect as some others. That means this album ain't totally flawless. One of the most hugely overlooked classics of the psychedelic 60's. Haymarket Square's Magic Lantern represents some of the best obscured psychedelia you can get. Their sound is so unique offering us flaming guitarwork by Marc Swenson, stunning drumming by John Kowalski, great bass by Robert Homa and of course the beautiful lead vocals of Gloria Lambert. Like I said, all of these songs are pretty lengthy (except "Phantasmagoria") and so much of the material here is just great jamming. That is one reason why I like this album so much. I have nothing bad to say about this record and for me, it remains as one of the best obscure albums from the 60's so I have to give full 5 stars. Really awesome record and for every psych lover this is absolutely essential for checking out. THE COVER IS NICE --- ABOUT EXCELLENT OR VERY GOOD++. - Cover has JUST A HINT of ring wear (nothing significant); On the scale from 1 to 10 (1 being the least, and 10 being the most severe), we assess the severity of ring wear as 2.